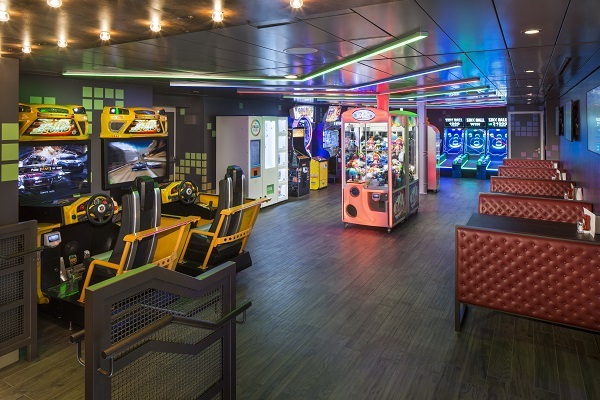 One of the newest venues to hit Royal Caribbean International ships is the Playmakers Sports Bar and Arcade on Symphony of the Seas. This new concept combines several of my past times- watching a game on the big screen, beer, and chicken wings. 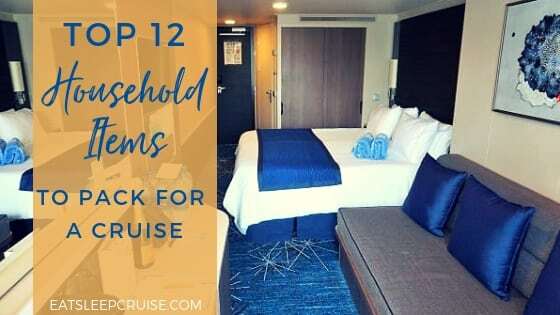 If you have a cruise booked on this record-breaking ship, we put together this look at everything you need to know about Playmakers Sports Bar and Arcade on Symphony of the Seas. 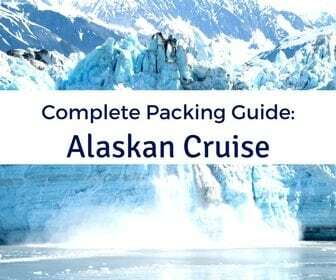 Where is Playmakers Sports Bar Located on the Ship? This restaurant and bar is located on the port side of the ship on Deck 6. It is perfectly situated on the Boardwalk, just forward of the Aqua Theater. This location allows for some outdoor seating. There is also plentiful seating inside that still allows for ocean breezes. We really like this open concept that makes the venue feel more lively and engaging, especially when watching the big game. For our sailing, Playmakers was open for dinner from either 5:30 pm or 6:00 pm every evening until 1 am. 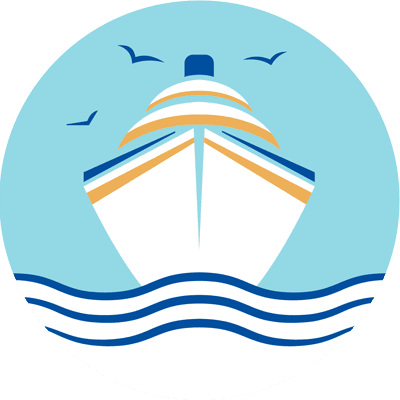 The restaurant was also open for lunch varying times between 11:30 am on sea days to either 1 or 2 pm in the afternoon during port days, depending on the scheduled time in port. 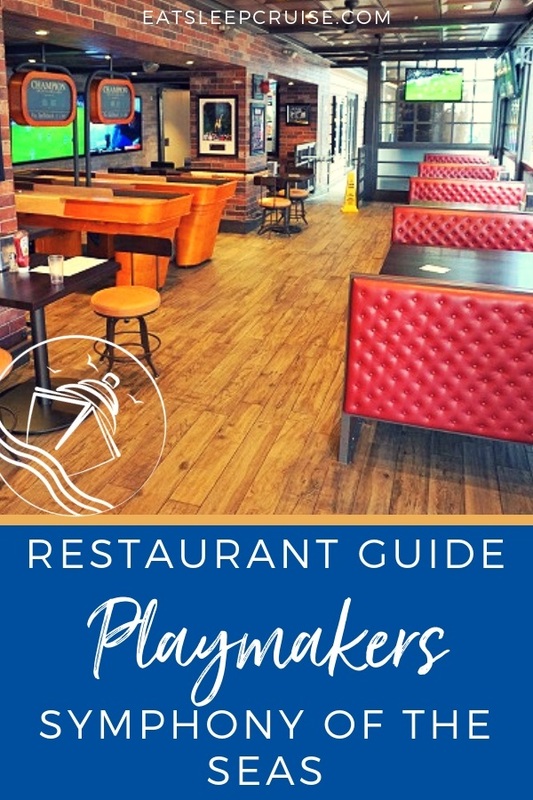 This made Playmakers Sports Bar a great place to grab an afternoon snack (and drink) after returning from a tour or shore excursion. Do I Need a Reservation at Playmakers? No, reservations are not needed. In fact, they are not even accepted at the venue. Although, the venue can get busy, so don’t be surprised if there is a short wait. Like a restaurant back on land, they will let you know when a table is available. If you are interested in just grabbing a drink at the bar, then you can walk in and grab a bar stool. The tables in the restaurant are reserved for those who are ordering food. 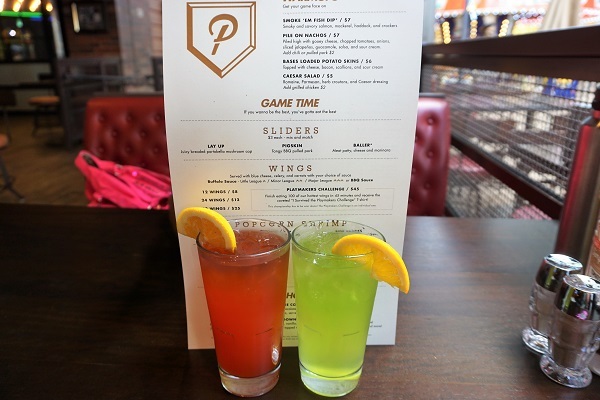 Are the Drinks at Playmakers Included in the Drink Package? Yes! 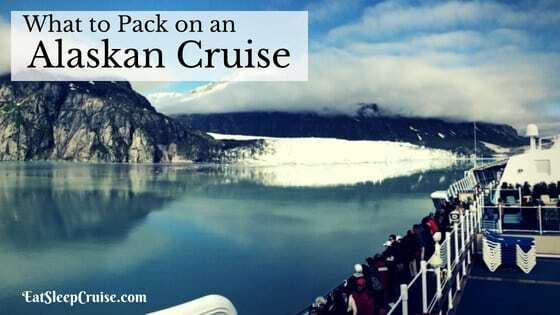 If you have the Deluxe Beverage Package, then almost all of the beers, mixed drinks, and glasses of wine are included in the package. 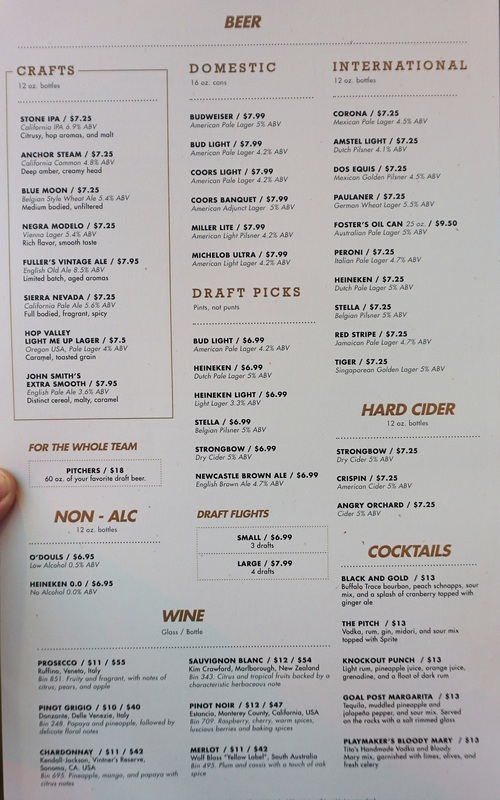 All of the signature drinks are priced below the package allotment of $13 a drink on Symphony of the Seas. In fact, besides one over-sized Fosters beer, all of the other alcoholic beverages are currently included. 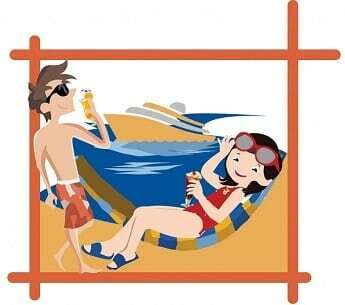 For cruisers on the Refreshment Package, the soda and bottled water at the venue would also be included. 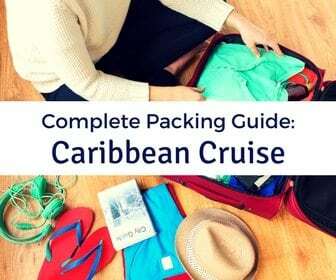 For cruisers who do not have a drink package, you would pay the a la carte prices listed in the menu. 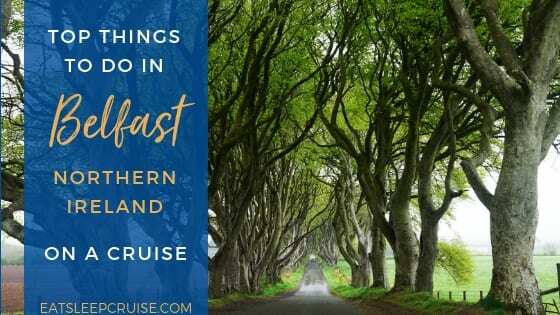 What About the Food, Is That Included in the Cruise Fare? No, the food at Playmakers is not part of the cruise fare. The venue is a “specialty restaurant”. Unlike many of the up-charge dining venues on the ship, the food at Playmakers is priced a la carte. This makes it a great option for lunch, a snack, or a good place for families looking to share items. There is no minimum charge, and you are welcome to order as much or as little as you like from the menu. 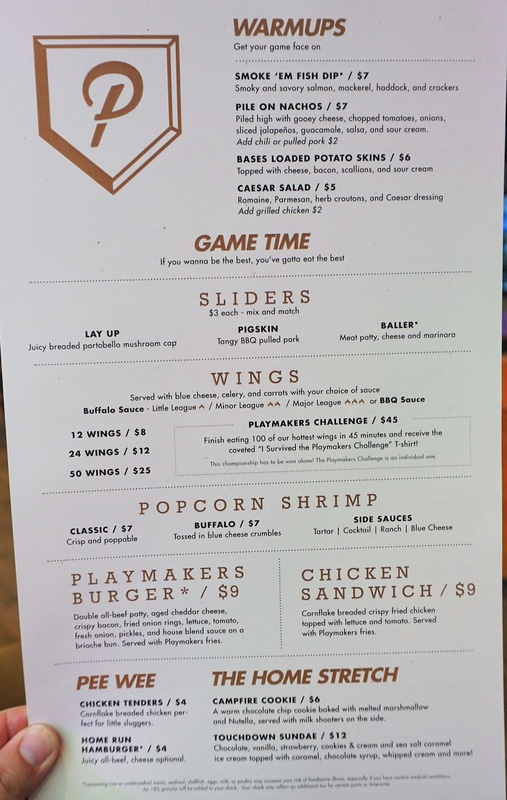 What Type of Food is Served at Playmakers? 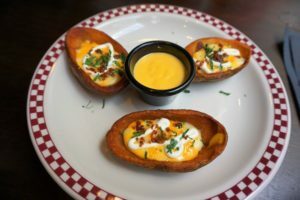 Like your neighborhood pub, Playmakers offers favorites like sliders, chicken wings, nachos, potato skins, and more. They also have a signature burger and chicken sandwich. There are also two desserts, both worthy of your consideration. If you want to take a closer look at everything that is offered at the restaurant, we have links to the menus below. In our opinion, the food is worth the up-charges. Are Children Allowed at Playmakers? Yes, children and families are welcomed at Playmakers. Like all restaurants, young children need to be accompanied by an adult. 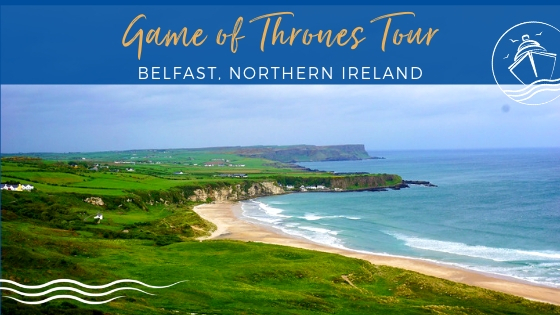 There are no age restrictions to who can play the games located in the venue either. 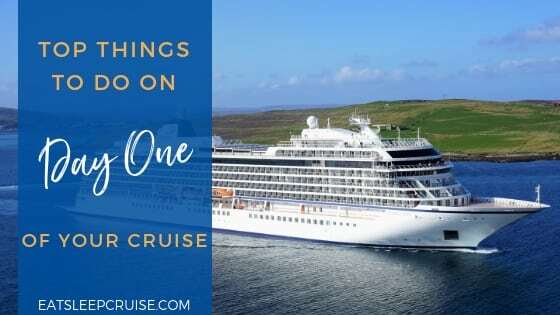 Just remember, the cruise line is not responsible for the behavior of other guests, especially during big sporting events being displayed on the screens. Do You Need to Pay for the Games? Yes…and no. The venue has some classic table games like Connect 4, foosball, and table shuffleboard that are free to play. When it comes to the arcade games, those are an additional cost. Honestly, the arcade games are pretty standard, and we did not see many people playing the games during our stops in Playmakers. Is Playmakers Worth the Additional Costs? For us, this is a big YES! We thoroughly enjoyed the food and the concept overall. The location on the Boardwalk makes it a great place day or night. 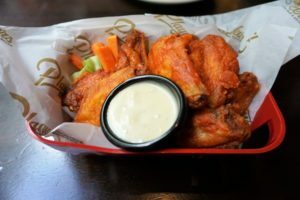 During our several visits to the location, the buffalo wings were always hot, fresh, and just spicy enough for me. The nachos were solid too. We suggest saving some room for dessert as well. 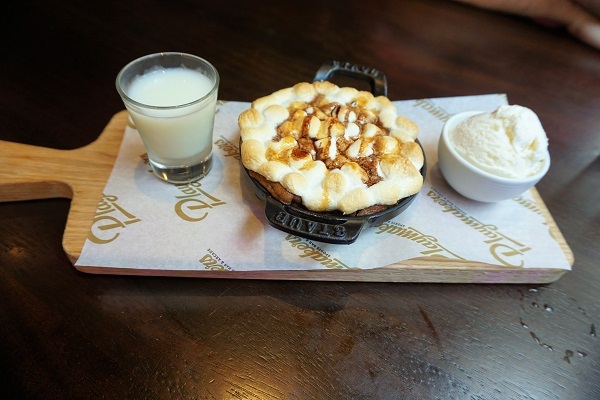 Along with the massive ice cream sundae served in a football helmet, the Campfire Cookie is a warm chocolate chip cookie topped with marshmallow and Nutella and a glass of milk on the side. It is quite heavenly! The large selection of international beers was plenty to keep me happy, but the Princess was not thrilled with the specialty cocktails. Is Playmakers Sports Bar and Arcade Found on Other Ships? 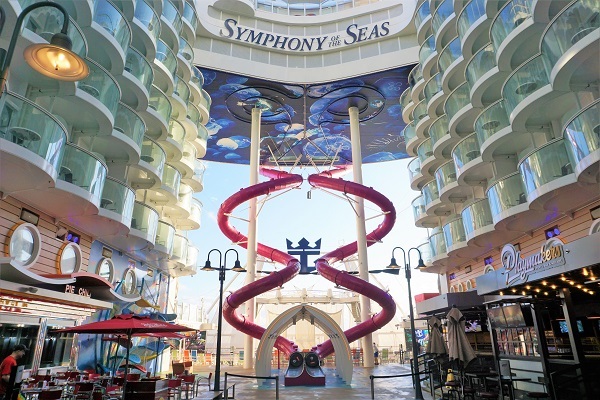 Currently, there are other Playmakers locations in the Royal Caribbean fleet on Navigator of the Seas, Mariner of the Seas, and Independence of the Seas. On each ship, the venue has a similar design and menu. The arcade is considerably smaller, and the venue does not have as much of an open feel as Playmakers on Symphony of the Seas. 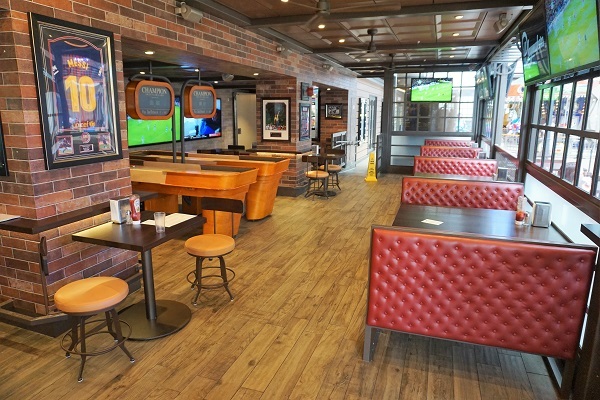 You can read all about our experiences at this version of the restaurant with our Playmakers Sports Bar and Aracade on Mariner of the Seas Review. 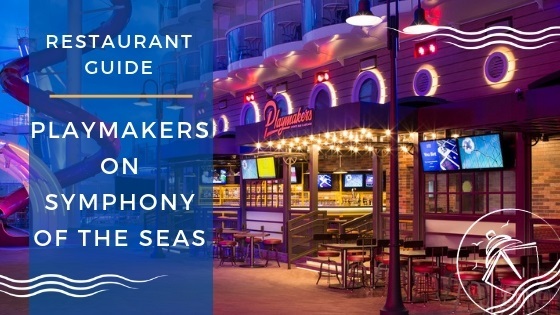 Have you enjoyed the food and drinks at Playmakers Sports Bar and Arcade on Symphony of the Seas? 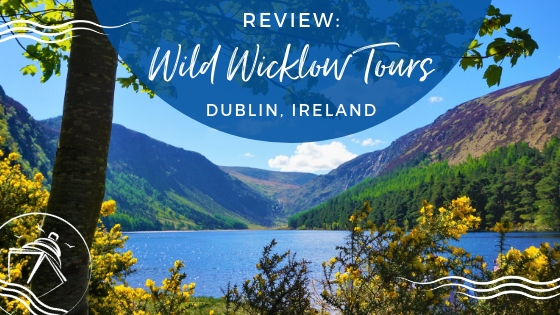 Do you feel this venue is worth the up-charge? 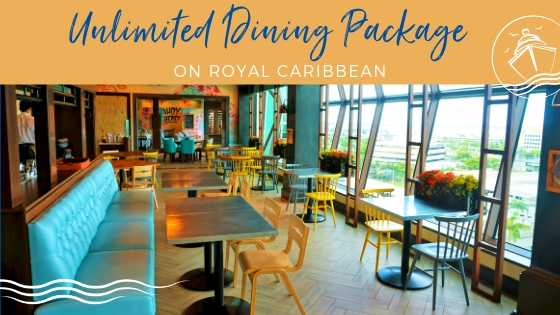 Drop us an anchor below to share your review of this new bar and restaurant on Royal Caribbean ships. Playmakers on Indy was on deck 4, not deck 5.